Vietnam Airlines | Optiontown - Unique Travel Options for upto 75% Less.Business Class Upgrades, Empty Seats, Lounge Access and many more. 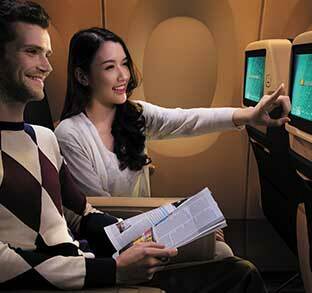 Upgrade to Business or Premium Economy for up to 75% less! How does it work? Upgrade Travel Option allows you to upgrade to Business Class or Premium Economy and enjoy the luxurious comforts and privileges for a fraction of the regular price (up to 75% less). If you have an Economy Class ticket, you can enjoy the comforts and benefits of upgrade to Premium Economy or Business Class. Similarly, if you are booked on a Premium Economy ticket, you can draw the comforts and benefits of Business Class with UTo. With this upgrade option, you get many of the premium class services, including the premium luxurious flatbed, gourmet meals & drinks, premier in-flight entertainment, faster immigration, priority check-in & boarding, faster security checks etc. Experience luxury and style at its best! Arrive at your destination refreshed, active and ready to go. If you have a flight booked with Vietnam Airlines, you can sign-up for UTo for a chance to upgrade to Premium Economy or Business for up to 75% less. 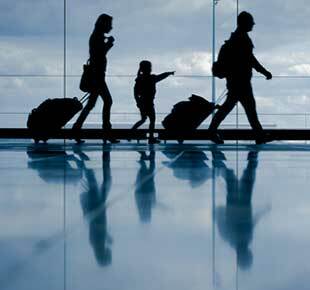 *Upgrade benefits may differ based on your specific flights. 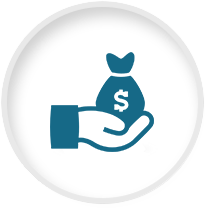 For exact benefits and/or conditions for Vietnam Airlines, please check the rules of the Vietnam Airlines on the payment page (before completing Upgrade Sign-up). 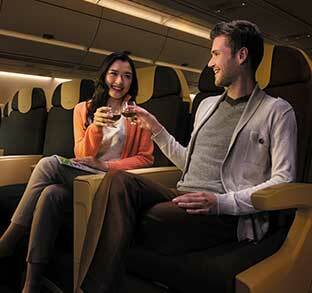 Get an upgrade to Premium Economy or Business for greater comfort and luxury for up to 75% less! Enjoy Luxurious Seating / Flatbed. Flatbed is on some routes only (where offered). Enjoy the comfort of Priority Boarding. Speed through fast track security lane for Business. 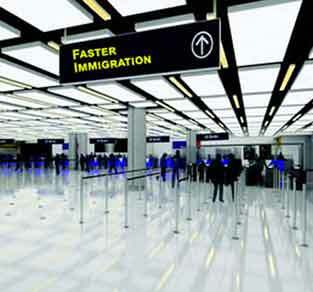 Speed through faster track immigration lane. Relax and unwind at the luxurious VIP Business Lounge. 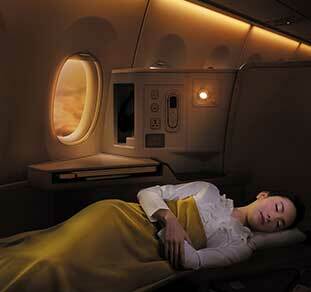 * Flatbed, Premium Economy and Amenity Kit are subject to service being offered on certain routes and flights. 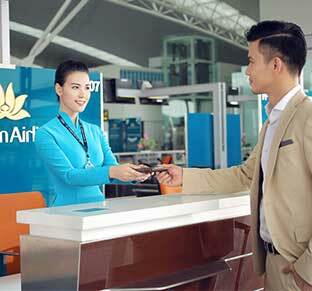 Visit vietnamairlines.optiontown.com and select the Upgrade tab. Select the class where you want to upgrade your flight. Pay a small Sign-up price and a nominal upgrade price (in this way enjoying up to 75% savings compared to Business fares). Upgrade Travel Option (or UTo) allows you to upgrade to Premium Economy class or Business class on Vietnam Airlines and enjoy the luxurious comforts and privileges for a fraction of the regular price (up to 75% less). With UTo upgrade, you get all the premium class services, including the luxurious flatbed or comfortable reclining seats, gourmet meals & drinks, exquisite business hospitality, extra baggage allowance, priority check-in & boarding, priority baggage reclaim, additional frequent flyer miles, faster security checks etc. Move up to a life of luxury! The UTo benefits may differ based on flights. For exact benefits and/or conditions, please check the UTo Rules at the time of UTo Sign-up. If you have a flight booked with Vietnam Airlines, you can sign up for UTo for a chance to upgrade to Premium Economy class or Business class for up to 75% less. Upgrade Travel Option (or UTo) allows you to upgrade to Premium Economy class or Business class on Vietnam Airlines and enjoy the luxurious comforts and privileges for a fraction of the regular price (up to 75% less). With UTo upgrade, you get all the premium class services, including the luxurious flatbed or comfortable reclining seats, gourmet meals & drinks, exquisite business hospitality, extra baggage allowance, priority check-in & boarding, priority baggage reclaim, additional frequent flyer miles, faster security checks etc. Move up to a life of luxury! If you are not upgraded, the Upgrade price paid for your upcabin will be refunded automatically to you within 5 days after the flight departure.